• 417 South Dearborn Street. The buildings will provide enough space for 6,200 people with “basement and upper floor shelter space to reduce radiation effects within the shelter to one-one hundredth of that outside,” according to Hicks. [Chicago Daily Tribune, November 12, 1971] These buildings are the first of 495 Loop buildings and 2,500 buildings in the city that have been selected as fallout shelters. Loop shelters will provide space for 2.3 million people while 4.7 million people could be handled in shelters in the rest of the city. It is expected that the posting of signs on the shelters will be completed within four months. November 11, 2005 – Wabash Plaza, the site of one of the nation’s largest Vietnam Veterans memorials outside Washington, D. C., is dedicated. Chicago Tribune architecture critic Blair Kamen writes that the plaza, designed by Chicago architects Carol Ross Barney and John Fried of Ross Barney + Jankowski and assembled using $4.3 million in state and federal funds, “is not only more visible than its predecessor. It is more stirring, infusing what might have been a mindlessly cheery waterfront park with the potent themes of tragedy and reconciliation.” [Chicago Tribune, November 6, 2005] Kamen sees the memorial as a beginning of a changing future for the river. “The plaza forms the first link in a chain of waterfront parks and public spaces that may someday stretch along the south bank of the Chicago River,” he writes. “Mayor Richard M. Daley’s big idea is to turn the riverfront, now a concrete no-man’s-land, into a kind of second lakefront. 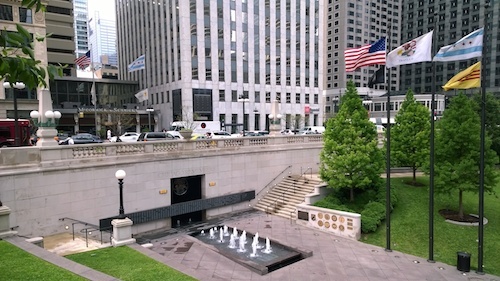 He envisions an entire Riverwalk from Michigan Avenue to Lake Street … while hardly faultless, Wabash Plaza makes the right strides toward reaching that heroic end.” The new memorial replaces a former Vietnam memorial located on Wacker Drive that was dedicated on November 11, 1982. November 11, 1973 – Chicago Tribune architecture critic Paul Gapp reports on five projects contained in the proposed $15 billion Chicago 21 plan. The first priority is to alter the Cabrini-Green public housing project and its surrounding area radically enough so that it will “serve as a pilot program for public housing thruout [sic] the city.” [Chicago Tribune, November 11, 1973] The second major project involves the construction of a Franklin Street “connector,” running just east of the Chicago River, connecting the Dan Ryan Expressway with the central business district. Another major focus is the construction of a central area subway, something that would allow the destruction of the Loop elevated system. Also in the plan is a proposal to create a vast new residential area for 120,000 people just south of the Loop on an unused railroad yard. Finally, the plan urges the creation of new residential developments in other areas of the city with a special consideration given to residential conversions of downtown office buildings. 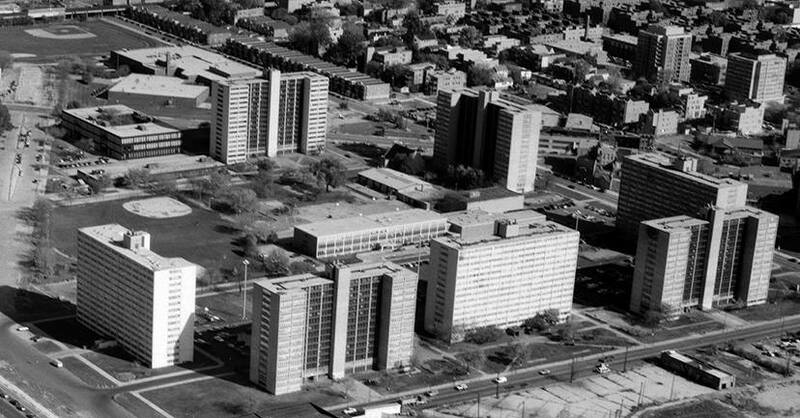 The above photo shows Cabrini Green as it existed at the time. Drive north or south on Halsted or east and west on Division today, and you will see a far different scene.